This page provides you with Staff Nurse resume samples that you can use for inspiration in writing your own resume, or for creating one through our easy-to-use resume builder. Below you'll find our how-to section that will guide you through each section of a Staff nurse resume. Staff Nurses work in one of the fastest growing yet most stressful industries at the moment and staff nurses like you are in high demand, making an outstanding resume a must for you! You are right, excellent staff nurses like you can find a job tomorrow or, if not, the day after tomorrow! The question is: do you want a job or are you looking for THE job? ;) We are here to give you the power to get the one you have always dreamt of and to help you get recruiters and hospitals take notice of you and your skills. 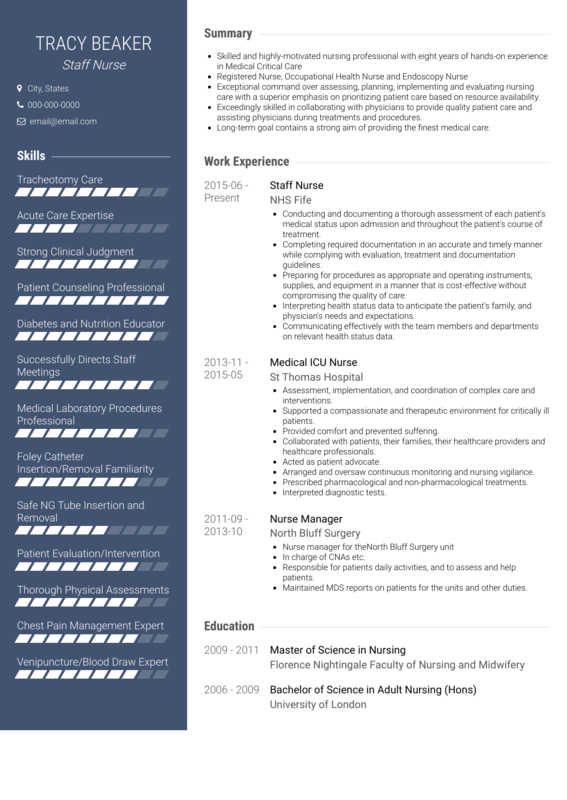 If you are looking for the perfect staff nurse resume sample to inspire you, look no further. Here at VisualCV we will help you creating that awesome resume that not only will inspire the employers to take a closer look at you as a staff nurse but will also give you and your confidence a massive boost. Let us inspire you, we have helped millions to build on their resumes and move their way towards their dream jobs: and guess what, you are next! As a professional and excellent staff nurse you are definitely compassionate, self confident and and able to bring a leadership feel to the each role you fill. Having these qualities, though, doesn’t mean that you will be able to get them noticed, that is totally a different task, a fundamental one considering the dozens of competitors out there all vying for the same position. Your resume must make the difference between you getting a second interview and being put to the back of the list: we’re here to help you! So firstly, you have to think about what information you want or need to add to the resume. Do you plan to include your background before being a staff nurse? Are you thinking more so about recent education rather than the education from twenty years ago? In truth, the education relating to your nursing career is more appropriate and the best place to start off with. Lastly, you have to remember, employers will look at your resume carefully and if you are inconsistent in places or have conflicting information then there are a few problems at hand. What you need to do to avoid these issues is to actually read over the resume in full and check to make sure you aren’t mistaken anywhere. It really does make a difference. Everyone has their opinion over summaries in a resume and while some might think it’s a bad idea, why not take a moment to consider it? Summaries are actually useful for many applicants because employers want to see uniqueness. Employers want people to stand out for all the right reasons and opting for a simple summary could be one element that makes you unique! Make a personal statement about you. Include the right personal details that employers need to know. Add information which might come across as negative. Use language which can be offensive. Opt for technical terms unless it’s absolutely essential. Employers want to see rich work histories. When you have a fairly decent background as a staff nurse that should all be included in your resume. Employers aren’t necessarily interested in your time as a computer programmer in your late teens they’re interested in the years spent as a staff nurse, in your clinical experience. Always, always bring out the experience that counts. No matter how insignificant it might seem, any nursing work experience can prove vital for you. But make sure you get as specific as possible: especially in a job like yours, details help recruiters understand what you’ve done and they’re quickly able to understand if you’re the right person for the job or not! Put the most important pieces of your employment history at the top. Don’t use language which might offend. Don’t be so negative about your lack of experience. Don’t keep the most relevant information at the bottom of the work history. Need more tips on writing an efficient work experience section for a great staff nurse? Check out our detailed resume guide! Applicants often panic when they realize they have to add their education and let’s be honest, you probably won’t relish this either. For most, they don’t like the idea due to the fact their education might be not as well equipped as they would like. However, you’re trained as a staff nurse and even if that’s your only real education, that’s a great achievement. When and where you studied to become a nurse. What are your current qualifications as a nurse practitioner? You, as a staff nurse, have gone through a great deal of education to get where you are and it’s very important to let your potential new employer know that. It can seem like an awful lot of information to put down but it’s actually good because it shows you have an education to back your skills as a staff nurse. What is more, even continuous education after being a qualified staff nurse can show you have the determination to learn and continue to improve. You don’t want to be screened out of an interview simply because you didn’t list your skills. You have talents and you need to let the employers know about them! Skills should show the best side of you and not just as a professional but as a person also. You want these to be one of the things that stand out in your resume and there are lots of skills you have and which should be included. One of the first things you should have drilled into you is honesty about your past talents or skills is a must-have for any resume! You can incorporate your hard and soft skills into the mix and hopefully you’ll be a standout candidate for the employer. It’s wise to add a cover letter with your resume. Follow our tips here. Include an updated email address. Use links which link back to a professional profile. Talk about promotions you’ve received in previous roles. Include any bad relationship, even with the worst patient! Don’t talk about your relationship with a partner. Don’t put down you want a certain amount of money. If an excellent Staff Nurse Resume sample is not enough, why don’t you check out one of the most efficient staff Nurse resume templates in the market? Many professionals like you have successfully used it to take their career to the next level.